The school run around The Lego Car Blog Towers is getting ridiculous. A sea of Land Rover, Volvo, Mercedes and Audi SUVs, you’d think the school gates were on the top of a mountain pass, not the middle of suburbia. Still, nothing but the best for little Alicia and Noah. With the current race to the bottom of the automotive barrel it surely won’t be long before vehicles like these start turning up ensure that children can be safely transported to their colouring lessons. Which we’re all for of course – if it means the bloody Audi Q7 is no longer top dog on the school run. First up to do battle at the school gates is the model above, a wonderful post-apocalyptic truck by TLCB newcomer Versteinert MOC. With a gun on the roof, knight’s shields for a front bumper, and machetes for front fenders, not even a Mercedes G-Wagon will intimidate this school-run Mom. Today’s second creation eschews offensive weaponry for defensive protection. Faber Madragore‘s ‘racing buggy’ includes a full roll cage and nudge bar, plus working steering and pendular suspension, all at mini-figure scale. There’s no room for Noah’s backpack – or even for him – but Safety First! There more to see of each build on Flickr. Join the school run madness via the links above! If ever there was a car styled by a TLCB Elf, this is it. Flickr’s Mark of Falworth clearly has Elf blood running through him which – whilst undoubtedly concerning for Mark’s friends and family – does mean his mind is capable of some gloriously outlandish oddities. There’s more to see of this one at his photostream via the link above. The Lego Car Blog Elves love post-apocalyptic violence. Possibly because they secretly harbour thoughts of a victorious Elven uprising that results in a brutal Elf-ruled dystopia. For now though thankfully these dreams only manifest themselves when they watch Mad Max films and an Elf gets run over by a colleague riding the wheeled mop-bucket. This particular TLCB writer finds the choice of transportation in the aforementioned films an odd one though. 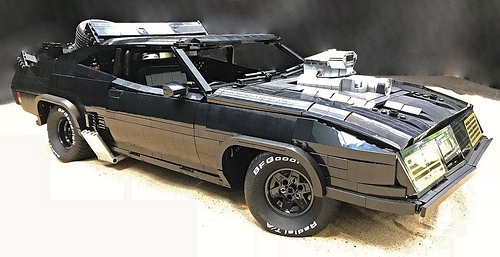 Always hugely over-powered, flame-spitting and gloriously thirsty, post-apoc vehicles seem completely opposed to what you would actually want in a world short on gas and spare parts. The perfect post-apoc vehicle is surely a Toyota Prius, Nissan Leaf or Honda Insight. Reliable, efficient, and quiet. And boring. Which is why movies shun their practicalities in favour of vehicles like this one. It’s a post-apoc chopper by Flickr’s Stephan Johnsson, and it fits the over-powered, flame-spitting and gloriously thirsty category perfectly. Entitled ‘Wasteland Roamer’ Stephan’s creation is beautifully constructed and there’s more to see at his phtostream – click the link above to fire it up. There seems to be a convention that following any variety of apocalypse (atomic, global warming, asteroid impact, alien invasion, zombie outbreak, massive Elf-fight, etc..), the overall decor will be rather drab. Tones of brown, black and grey will predominate, with the occasional beige camper van. 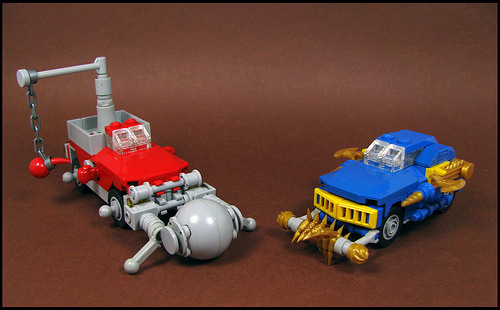 Fortunately Flickr’s Karf Oohlu has decided to cheer everyone up with a pair of brightly coloured post-apoc vehicles. Click this link to his Photostream to enter his weird world. If the Elves went to school, this is what they’d ride in. This would be to ensure the safety of the community, but we have a feeling that they would love it too. Suggested by a reader, you can see more of James Cox’s post-apoc Mad Max-esque school (of hard knocks) bus on Flickr. 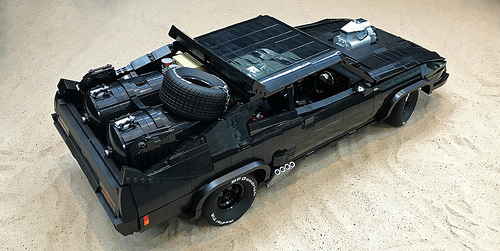 Today’s second Mad Max creation comes from Flickr’s Doctor Mobius for the LUGNuts ‘100 Way to Win’ challenge, and it’s… er, we’re not entirely sure. But we’ll trust him. He’s a doctor. See more here. ‘Boning’ and ‘Ploughing’ are both likely to bring up some interesting Google search results, but such is our maturity you won’t find any mention of that here, no sir. Anyway, this bone-driven post-apoc ploughing pick-up was found by one of our Elves on Flickr, it’s been built by nurunaunanai, and there’s more to see at the link above.